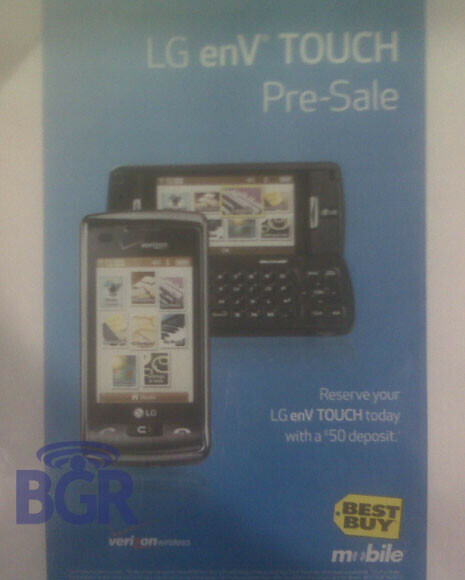 How would you like to guarantee that you will walk out of Best Buy on June 5th with an LG enV Touch? Put down a $50 deposit at your local Best Buy store and you can pre-order the device for pick up on the launch date. But while you can pre-order the successor to the LG Voyager with a small deposit, that option is not available for the retailer's offering of the Palm Pre. BGR was able to grab the retailer's director of merchandising, Scott Anderson, and ask him some questions about the upcoming launch of the Pre. Anderson admitted that the device could be in short supply for the first 4-8 weeks following the June 6th release. To deal with the expected crowds and lines, Best Buy plans on using a "ticketing process" starting June 6th, and once a store runs out of stock, names will be entered on a log in chronological order. In other words, unlike the enV Touch which has a release date one day earlier, there will be no deposits taken for the Pre. Every Best Buy store that offers Sprint products will have some inventory of the handset to sell on the launch date.